I was totally getting into a creative flow while making these collages. I don’t know if you can tell, but this week was super fun and exciting. I got several new ideas that I tried out and I’m really liking the resut. I hope you do too. Let me know in the comments what collage is your favorite – and why. Thanks! 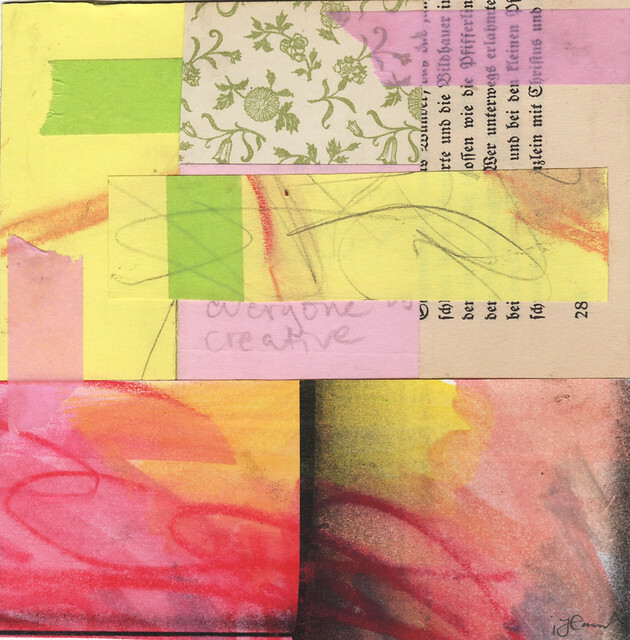 None of these collages are showing my inner work stress, instead they linger in a feeling of hope and spring. I am only using favorite colours, and prettiness and I think it’s working. 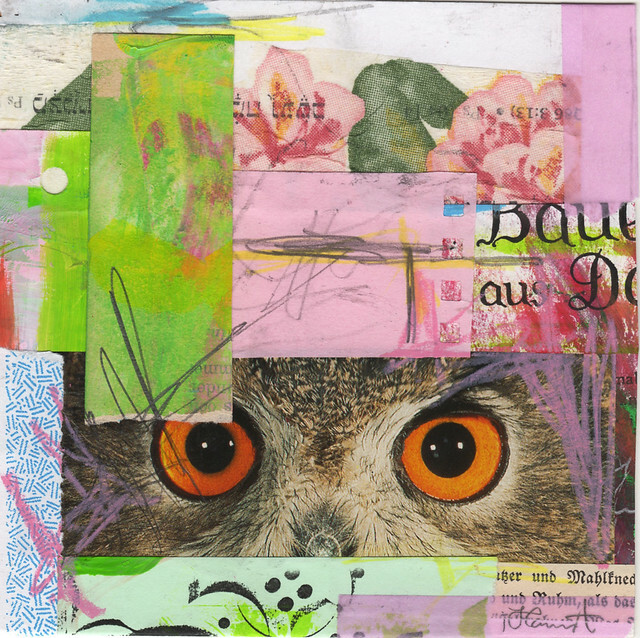 Remembered how much I love owls, and sticky notes, and washi tape, and roses, and… collage! Wishing you a great and beautiful Glue it Tuesday! 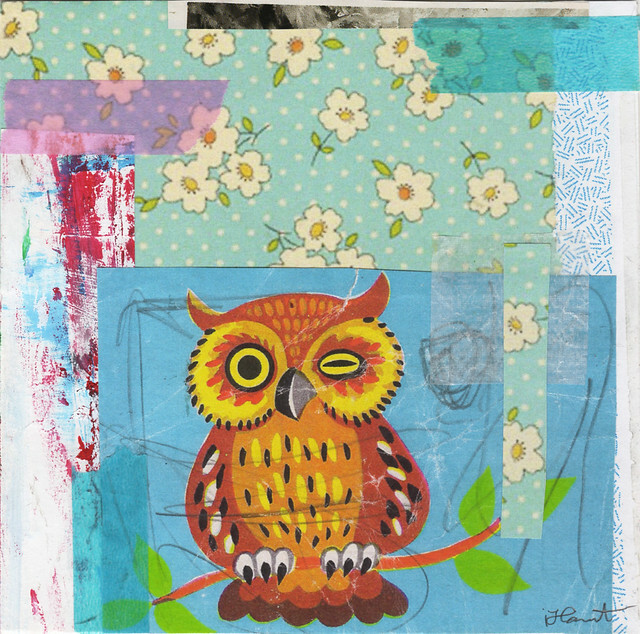 This entry was posted in Collage and tagged 365in2013, owls. Bookmark the permalink. I love all of them but really like the depth of “everyone is creative”. 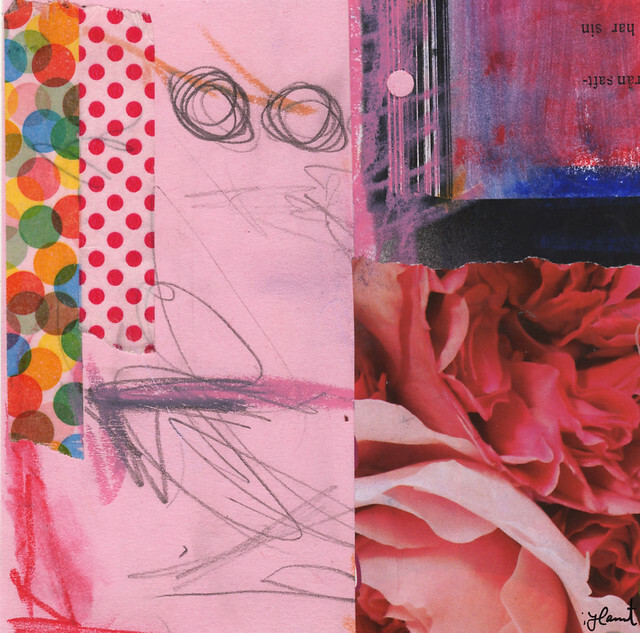 I love the look of the pencil markings…it really adds a lot to this buch of collages. all that pink and then a cute little owl winking at me! awe I feel special. Great bunch of collage offerings today. Ooh, hard to pick a favorite, but I guess I’ll choose Rose Garden II. I like the slightly hidden aspect of the writing. A bit of mystery there amidst the roses. work, it’s very inspiring. Thank you for sharing. 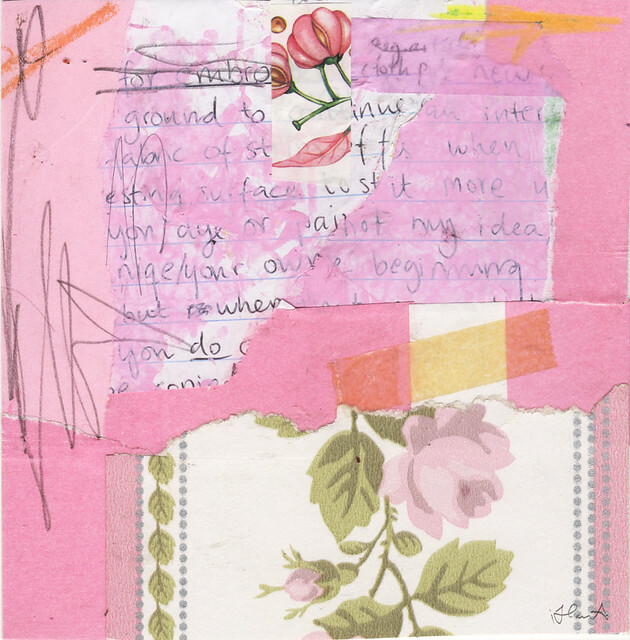 It looks like a child’s been having fun with your collages and a pencil! And I mean that in a good way. Lovely! I love them all but if I had to pick one this week it would be “Looking At You” because I love owls and it’s fun and playful! Great work! Hi, Hanna. 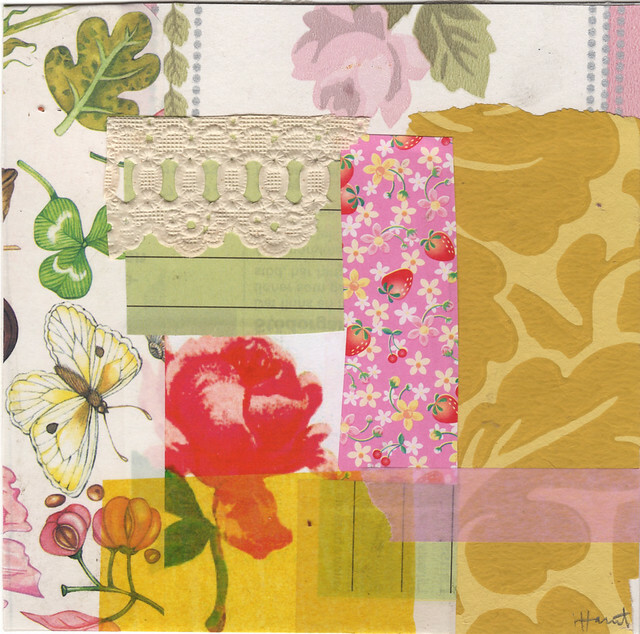 I know what you mean about collaging with favorite colors making you feel better. I think I may be becoming a collage fanatic. I cannot wait to finish this collage journal and go to the next so I can add to them or not, and fill the shelves with things that make me reflect and enjoy. I love the wall paper on Rose Garden I. I think that’s my favorite one here, because of that and the pop of flower. I also love the winking owl and the big owl eyes in Looking At You and All Eyes. I put fish eyes on one of this week’s collages and just love how that looks. I am loving my origami paper collection, too. 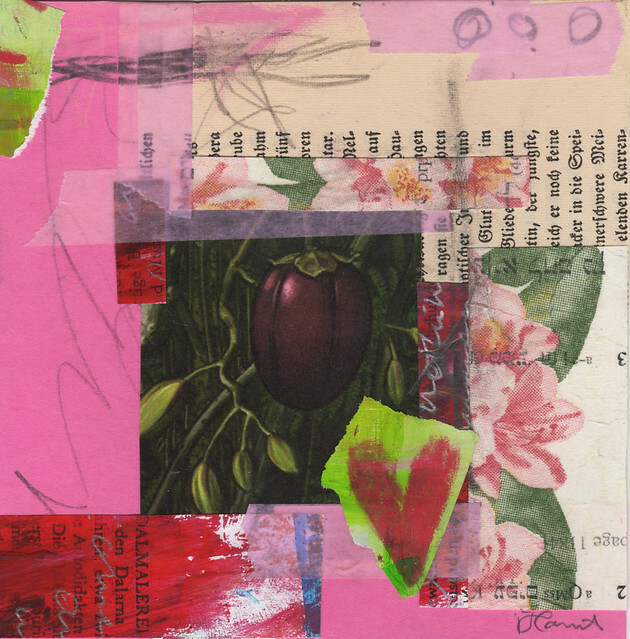 Thanks for your sweet comments about my collages! It’s been such a great collage year so far, and I can’t wait to do the next “batch” of collages and dig through another one of my scrap boxes. Fun! I like them all, it does look like you were having fun. I think my favorite is Rose Garden II. I like the soft colors and hidden writing. I cannot believe that I missed to comment your post, because it is so lovely. I do like your linework. It makes it so special!